Refind's part will be to provide and improve the feeding, identification and sorting of cellphones in order to optimize the disassembly of components or preparation for reuse depending on the model or condition of the cell phone. We will provide the technology to determine brand and model of each phone, information that can be used for registration and setup instructions for the down-stream process. We will work closely with ProAutomation, an Austrian company specializing in automatic disassembly of cellphones. Project partners: Fairphone, Fraunhofer, Multimedia Computer System Ltd., Pro Automation, iFixit, ReUse-Computer, Technische Universität Wien, Semicon, Grant4Com, RFND TECHNOLOGIES AB, AT & S, Speech Processing Solutions, PrimeTel, SAT and Blancco. The Nature Conservancy’s Indonesia Fisheries program is working with Refind Technologies and the American sustainability entrepreneur Seth Heine to identify fish. The project is called Fish face and the ultimate goal is to build this technology into a smartphone app that could be used on fishing boats throughout the region and eventually be deployed around the globe. Through the use of affordable image recognition software that will detect species from photos, much faster and more accurate sorting of fish will be possible at the processing plant, or even as it is landed on the boat. Ultimately, the pilot of the Fish face technology will offer a low-cost assessment of fish stocks - providing the essential data needed to assess and manage fisheries that are struggling around the world. Seth Heine is a serial entrepreneur with a background as a successful inventor applying recognition systems and artificial intelligence for electronics recycling, and has also successfully built and funded start up companies and projects across various technologies and applications. Winner of the Google Impact Challenge 2016 Australia! The FISH FACE project was nominated as one of 10 finalists in the Google Impact Challenge competition held during the fall of 2016. All finalists were granted a 250 000 AUD award, and 4 of these 10 would be elected as winners, either by the people or by the jury. The voting took place during 3 weeks in October 2016 and was completed by October 26th. The FISH FACE project was the People's Choice Winner together with another project, Great Barrier Reef Foundation, and another 3 projects were elected winners by the jury. Refind are very proud to be part of this project together with The Nature Conservancy and Seth Heine, a serial sustainability entrepreneur. More info about the Google Impact Challenge can be found here and more info on the actual project will be posted at the Refind site continuously. Update July 2018: FISH FACE TANK INSTALLED IN KUPANG, INDONESIA! In July 2018, the Fish Face tank was installed at a fishery site in Kupang, Indonesia, by Refind and TNC. The equipment will be used to capture sample images of different fish species and build up a dataset for the first Fish Face Classifier. The device will be evaluated both in terms of hardware and software before the next step, which will be to install the equipment on-board a fishing boat. Once the classifier is good enough, it will be used to start registering size, specie and geographical location. Below are the first images of the newly installed Fish Face tank along with images taken by the equipment. 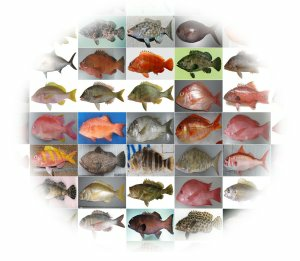 The image collection phase includes photographing and naming thousands of fish photos. Depending on how much the fish species can differ within their own specie and compared to other species, the number of images needed will vary. In this piece of equipment there is a length limitation of about 80 cm for the fish. Above: Project responsible Peter together with Abbe and Joseph, all from The Nature Conservancy, holding a newly photographed red snapper. Below: four samples of different fish species photographed in the Fish Face Tank as part of the database buildup phase. Abbe holding a red snapper in front of the Fish Face tank. Adaptive Automated WEEE Sorting 1: Battery Extraction - that is what AAWSBE1 stands for. Not the most catchy project name ever, but with a very interesting scope and content! The project aims to build a robot prototype collector which picks battery containing items from a stream with mixed e-waste. The main challenge will be to identify specific items among others with a cluttered background. Once recognized these items need to be localized and picked and removed successfully from the moving conveyor belt with a pick and place robot. In this project Refind are working with the Danish Technological Institute in Odense and Stena Recycling in Vissenbjerg. It starts in May 2016 and will be completed during the fall of 2017. As can be seen in the film, the project succeeded in its tasks to correctly identify, locate and pick objects in a mixed stream of used electronics. The main challenges were to identify items not fully visible on the conveyor belt, and also to pick them. The picking gear was thoroughly tested in order to get a grip that would work on uneven surfaces. Thanks to the project we were able to develop a new product, to be called The Refind Sorter, which we will post more info about shortly. We are happy to have worked with Danish Technology Institute, from whom we have learnt a lot. SOMEWAIR is short for Sorting Of Mixed E-waste With Artificial Intelligence Robotics and is a joint project with the Danish Technological Institute and Danrobotics. The project begins in April 2016 and will be completed during the fall of 2017. Similar to the one of the other projects, this also deals with sorting of mixed e-waste, an area where many improvements can be made. The main challenge for Refind in this project is to use recorded movies as a faster means of building up image databases. The movies will be showing a mix of objects and one part of the research will be to localize the objects in the image, another part to successfully track this object throughout the recorded images. The main challenge for Refind in this project is to use recorded movies as a faster means of building up image databases. The movies will be showing a mix of objects and one part of the research will be to localize the objects in the image, another part to successfully track this object throughout the recorded images. The project was successful and managed to reach the wished-for results: a scanning program that could track objects on a recorded movie - a series of images - thus making it possible to get multiple images from one labelling activity. We have also successfully tested to import images taken by other camera devices. The challenge so far is that the program only works on certain operative systems, something that we hope to work out a solution for shortly in order to make the program more flexible. This scanning program will be incorporated in the new product, The Refind Sorter, soon to be launched. This project has received funding from the Eurostars-2 Joint Programme with co-funding from the European Union's Horizon 2020 research and innovation programme. The SenSoRe project name is short for Sensors and Sorting for innovative Recycling. It is a Vinnova funded project initiated and led by Swerea KIMAB in Stockholm, but has a long list of participating companies, both from the recycling industry as well as from the research sphere. The project objective is to create a neutral test bench platform where industry and research can meet in order to enable more innovation being done within material recycling and reuse. Refind will participate as a technology and sorting equipment provider. The SenSoRe project started officially in the end of 2016 and will continue until 2021. More info about the project and its partners can be found here.